We all need to be circumspect of subtle changes in personality, balance, judgment, memory and anything else uncharacteristic in our friends and family. Be Proactive and we can be less Reactive. The recent article on the Alzheimer’s Reading Room, Problems with Balance, Walking, Falling Can Be an Early Sign of Dementia, started me reflecting on a series of falls my mother experienced as well as other soft signs of her decline, or not so soft when she fell to the floor. At four feet, eleven inches, my mom was definitely petite and slender. 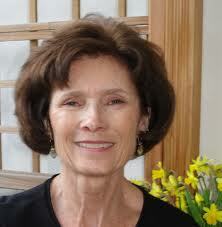 She maintained her weight over the years and used an exercise bike or treadmill. Mom was an avid reader, a college graduate and had many other talents. She also had Ménière’s Disease, defined by the National Institute on Deafness and Other Communication Disorders, as a disorder of the inner ear that causes severe dizziness (vertigo), ringing in the ears (tinnitus), and hearing loss. Despite debilitating vertigo-the sensation of movement when there isn’t any- from Ménière’s, Mom had never fallen because of it. Actually by the time Alzheimer’s was evident, Mom’s vertigo was dormant, a “burned out Ménière’s” as she referred to her disease. She remained stone deaf and still had the irritating tinnitus but it was unlikely that her increasingly frequent tumbles to the ground were from vertigo. Mom was well into the ravages of dementia when she started loosing her balance and seemingly without an obvious cause. She would be standing one second and on the floor the next. The numerous slips, slides and crashes to the floor necessitated a minimum of three emergency room visits for “unwitnessed falls or when she hit her head.” Her petite body was peppered with bruises, a nosebleed, elbow scrape and bent glasses frame as proof. My mother definitely would not have passed the one-leg balance test, described in the Alzheimer’s Reading Room article, by the time her idiopathic falls began. As an occupational therapist by profession, I understand the various neurological ramifications of failing a one-leg balance test. In keeping with the expression: “I wish I knew then what I know now,” I wonder if my otherwise fit and agile mom could have passed the balance test and stood on one foot when she got lost in my cousin’s house (in Arizona) looking for her apartment. (in Michigan, 2005). Could she have passed it when she started exhibiting clear signs of paranoia and suspected that “people” were stealing her pants, a nail file or “seven dollars worth of stamps” (2006)? Would she have cooperated if I had asked her to stand on one foot when her formerly kind temperament unraveled into a sinister, agitated and hostile person that I didn’t recognize. If failing this relatively simple test is indeed an indication of “low cognitive reserve”, it will be another tool in the expanding arsenal of evaluation assessments available to help families be altered sooner rather than later to the potential decline of someone they care about. Although I have lived dementia’s ugly, unpredictable journey with my mom, I’m a daughter not a medical expert on Alzheimer’s. That said, I have often wondered if Mom’s excessive attention to her calendar and recording was a new strategy she employed initially to supplement her unreliable memory skills. Subtle changes are suspect to me know. Instead of listening to me as I talked, I noticed she started taking notes about trivial things like what her granddaughters were doing or what restaurant I had been to. Mom was over-meticulous about jotting names, dates and other information as I answered her prepared list of questions. I recall her studying or staring at her written copy when there was a lull in the conversation. What I interpreted as Mom taking a moment to just review the information might have been her straining to absorb the meaning of the jumbled words on the paper. My mother expressed “knowing that my memory is bad” early into what ultimately was diagnosed as Alzheimer’s Disease. All of us use an appointment book or calendar to note important day, dates and times, a snap shot reminder of upcoming events. For years, Mom used two, one in her purse and a large one hung on the refrigerator. Gradually though I noticed (again now with such crystal clear clarity of hind sight) her employing a third and soon after added a forth calendar. Mom’s attention to what she recognized in herself as a shaky short-term memory and the need to compensate served her well for about a year. Is using four calendars an indication of over vigilance masking significant memory decline? Of course gradually Alzheimer’s cruel progression took over and no sign, sticky note, bulletin board, email or verbal reminder could withstand Dementia’s insatiable appetite for brain cells. She didn’t remember when I was coming to see her, couldn’t manage her medications, stopped doing her laundry-the evidence of which was seeing her habitually in the same pink outfit still stained with chocolate dribbles from our lunch together weeks before. Less Crying = More Dementia? I use to tear up for practically every thing; obvious tragedy and loss, the image of a cute kitten, when I was out of Coke (the soft drink, not the drug! ), a trait I inherited from my mom. Mom was four-months pregnant with me in 1951 when my parents were involved in a devastating car accident which killed my infant brother David. Appropriately Mom’s eyes welled with tears every time she talked about him. More than forty years after that horrific night, when my daughters were ten and older, their grandmother still teared up talking about David. Fast forward to 2004 when both her husband (my dad) and her other son (my older brother Jerry) passed away; Dad from stroke complications and Jerry from cancer. My brother had told our parents about his very bleak diagnosis in May 2003. Mom definitely cried then as she heard and instantly processed the devastating news. For twenty months Jerry fought a valiant battle enduring the cornucopia of side effects from chemo, radiation and cancer drugs until ultimately succumbing on December 30, 2004. My husband and I were with Jerry in Atlanta when he literally took his last breath. Since Mom lived in Michigan and was deaf from Ménière’s, I had pre-arranged to have Mom’s closet girlfriend deliver the news to her in person and stay with her since I couldn’t. Within a week after Jerry’s death I was also back in Michigan and drove over to see Mom. I was surprised but also stunned at how well she was coping. She didn’t collapse in my arms in a puddle of tears, not that she wasn’t entitled. Honestly I was relieved that I didn’t have to diffuse her grief as well as mine. I viewed her emotional stability as a sign of acceptance. I know I had cried incessantly as Jerry’s inevitable death approached. When that fateful day was behind me, I could begin to heal and assumed Mom was following a similar stage. Although my perceptions are subjective, I knew my mother extremely well. In retrospect, I believe now that Mom went into protective shock and never came out. She rarely spoke of Jerry with tears in her eyes, for which I was grateful but should have been suspect. I wasn’t surprised that Mom missed my dad, but he had steadily declined over a nine-year period after his debilitating stroke and Mom had been on the brink of complete exhaustion when he passed away in April 2004. Clearly it was “a relief”. But her son was a different relationship and situation all together and she had already buried one child; Jerry was the second she had outlived! In obvious clear retrospect, I am positive that Mom’s bland emotional responses were an indicator of underlying Alzheimer’s just beginning to invade her memory, pretzel-twist her personality and perceptions. We all need to be circumspect of subtle changes in personality, balance, judgment, memory and anything else uncharacteristic in our friends and family. Be Proactive and we can be less Reactive. 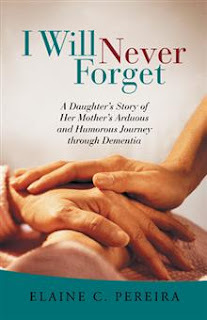 Elaine C. Pereira is the author of I Will Never Forget - A Daughter's Story of Her Mother's Arduous and Humorous Journey Through Dementia, and a finalist for the Best New Non-Fiction USA Book Awards & The Hollywood Book Festival.